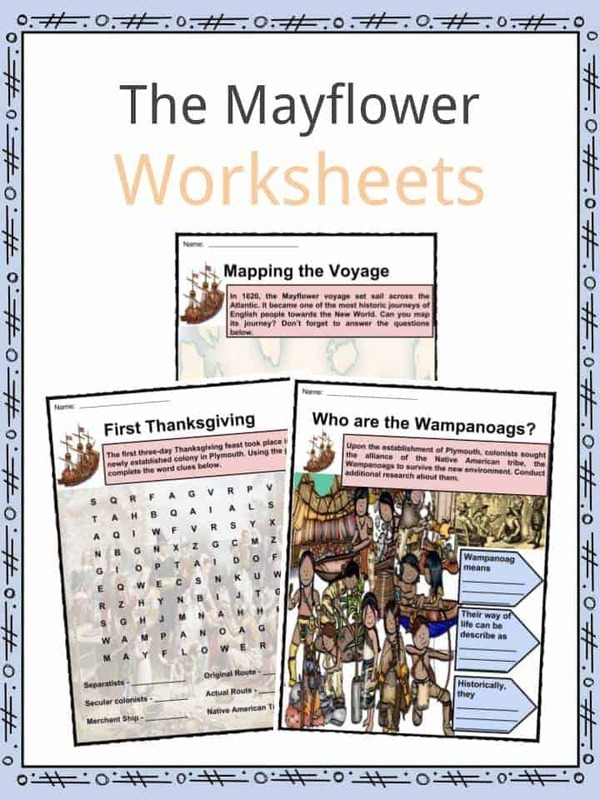 In 1620, the Pilgrims from England boarded the Mayflower ship going to Plymouth. In American colonial history, Plymouth was the first permanent settlement in New England. 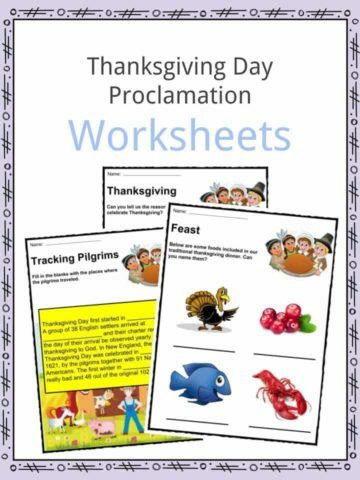 After the first successful harvest, the colonists celebrated with a three-day thanksgiving festival. 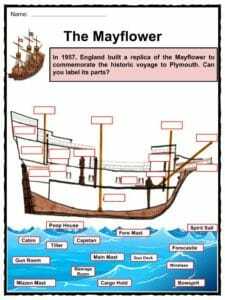 See the fact file below for more facts about The Mayflower and it’s historic journey or alternatively download our comprehensive worksheet pack to utilise within the classroom or home environment. Mayflower was an English merchant cargo ship usually carrying wine and dry goods. In September 1620, the Mayflower set sail to Plymouth with 102 passengers. The Separatists found religious freedom in Holland yet they faced difficulty in their secular life. William Bradford, a Separatists leader, noticed that Holland’s atmosphere was dangerous for Saints’ children. In search for a new settlement, Separatists returned to London to plan their migrations towards the New World. Upon the approval of the King of England, they agreed on the plantation settlement from the Virginia Company. In August 1620, merchant ships Speedwell and Mayflower set sail from England with nearly 40 Saints and secular colonists known as the Strangers. On August 15, 1620, the Speedwell leaked, leaving Mayflower to set sail alone. 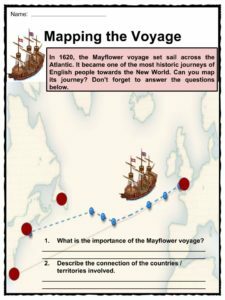 Mayflower’s journey became unpleasant due to heavy storms. 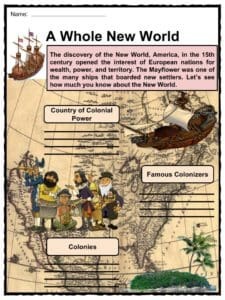 After two months, Mayflower reached the New World. They arrived in a wrong location where they found an abandoned Indian village. Their original destination was in the area of the present Hudson River but on November 21, they landed in Cape Cod, now Provincetown, Massachusetts. The Mayflower sailed back to England in April 1621. Nearly 53 passengers and half of the crew survived winter. More than half of the Plymouth colonists died of malnutrition, disease, and abrupt change in weather. 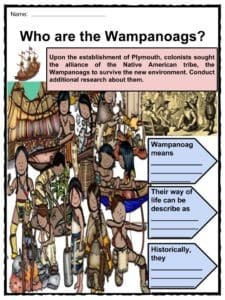 Samoset, an English speaking Pawtuxet helped the colonists to make agreements with the native Wampanoags. 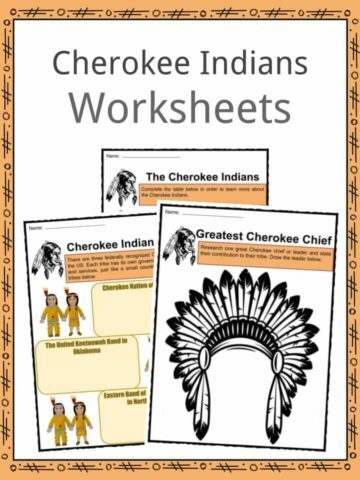 The native people taught them how to hunt wild animals and plant vegetables such as corn, squash, and beans. At the end of the summer, Plymouth celebrated their first three-day Thanksgiving because of a successful harvest. Soon, the Plymouth colonists were included into the Puritan Massachusetts Bay colony. Meanwhile, the Mayflower Saints and their lineage continued to be influential to the Christian world. In 1957, a replica of the Mayflower was built in England and sailed to Massachusetts to commemorate the historic voyage. 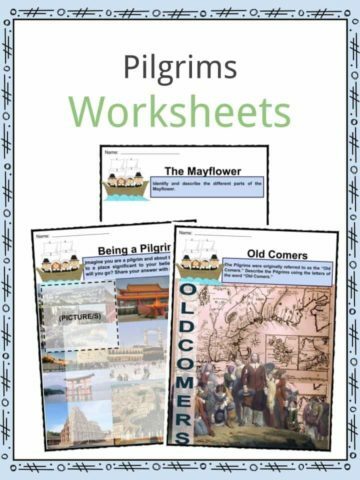 This bundle contains 11 ready-to-use The Mayflower Worksheets that are perfect for students who want to learn more about The Mayflower which In 1620, the Pilgrims from England boarded going to Plymouth. In American colonial history, Plymouth was the first permanent settlement in New England.